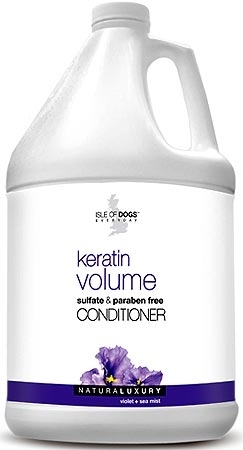 ISLE OF DOGS Keratin Volume Conditioner is a rejuvenating protein-based formula that helps to add volume and fullness, aides with combing the coat after a bath, and also helps with releasing dead hairs that may be caught in the coat. It helps make the brushing process much easier and reduces tangles. It also will help lay the coat down and give it that super soft and silky feeling.